Soon after promoting and partnering with Bollywood’s most sought-after award function IIFA, leading bicycle manufacturer Hero Cycles has recently roped in Bollywood actor Arjun Kapoor as its new brand ambassador. 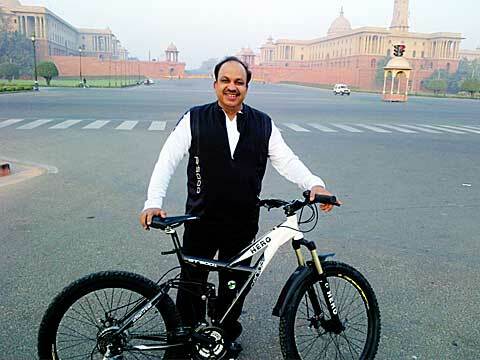 At the sidelines of this high-profile announcement event in National Capital, Wellness India spoke to Pankaj Munjal, Co-Chairman & MD, Hero Cycles to find out their objective behind promoting cycling with the Bollywood heartthrob, the brand’s objective behind associating with IIFA Awards and its debut on the online marketplace. My forefathers came from Pakistan and we, the current generation, have been able to build about US$6.5 billion group. If one generation has done this, than, we’ve got one lesson out of it, which is, give 105 to the customer for the product he is paying Rs100. Every time you purchase a Hero product, our ultimate objective is to give something extra to our consumers and that surprise is what we work for. We’ve also made a philosophy which is termed as ‘Go Further’. If we design a product, than it should be different, if we would offer service, it should be different. Every day I take a meeting at 7pm on watsapp, where I entertain all the complaints, suggestions and reviews of the day. All my employees are aware that I would see to it. Till next day, if issues are not sorted, so we have an 8D analysis we do that. It has been a monumental year for Hero Cycles for both brand and business initiatives. We are ecstatic that youth icon Arjun Kapoor is now associated with us and will represent our brand and its ethos in the public and media. His resilience to stay fit despite all odds makes him an extremely popular among young generation and the transformation of him as a health and fitness conscious person has made him a great role model. We will soon be coming out with our first TV commercial with Arjun Kapoor which will be one of our major initiatives in recent times. We’ve got 2000 dealers and if you go in very remote areas, they didn’t even get a single opportunity to go out of their villages. Thus, to show them the world outside their villages, we’ve made our dealers sit next to (Bollywood Divas) Madhuri (Dixit Nene) and Jacqueline (Fernandez) to make them aware of outside world and follow the same strategy to sell their products. So, my dealers are extremely motivated. We did conferences with IIFA and you would’ve seen it on July 5 IIFA Awards telecast on TV. This way Hero and IIFA are associated. We have been closely watching the evolution of our consumers’ behavioral pattern. We decided to make our entire range of cycles available online to make it easier and more convenient for our buyers to pick, compare and choose from our wide range offerings. These cycles will be home delivered to our customers through our existing channels of distribution. We see online with a potential to become one of our major sales channels, not only giving us access to the urban consumers but also allowing deeper penetration in the rural markets. Though E-commerce is brutally non-emotional, however, when the product comes home and the father-son goes for cycling together, those emotions at flow are invaluable. The segment is equally exciting too, even though; it has slowed down the health activity and speeden up the business activity. You transact more on the phone, communicate more on the phone without making an effort to get-up from your seat and make an effort to go and meet the concerned person. Even to purchase an inventory, you place order online and don’t go to a shop to check and feel the product. However, we can’t deny the necessity to create good presence there (online). So, we did a lot of study and we got clarity over customer demand of receiving the perfect product as seen by them on the internet. Else, they’re gona through it back. So, we, we did a lot of research over the last mile service. And thus, we’ve spent adequate time over the research part and extended our presence at online too. The change is really happening now. The globalization, internet, Hero’s large not by being international, Hero is large because India is large. Hero is progressing with India. But, now we are foraying into European market. We would take a significant share in Europe. Hero will be a significant player in Europe with technically advance products. Dermalogica india's big growth plan..